Blogging has grown to be a very popular pastime and a significant source of income for many people. Have you thought about making money from blogging? It looks as if it’s as simple as registering a domain name, setting up a hosting account and writing about things that interest you. However, the reality is that blogging in its own right won’t make you rich. What a blog can be is a powerful point of leverage to make money. It’s one thing to start a blog and publish your thoughts about something you’re interested in, it’s another challenge altogether to get people to visit your site and read your articles. In fact, attracting traffic to your website is a must if you want to make money blogging. However, even a considerable amount of traffic won’t necessarily convert into cold hard cash. It is possible to make money from your blog by selling ad space and displaying Google AdSense ads, but for everyday bloggers, advertising revenue rarely adds up to a significant amount. For example, it’s not uncommon to earn a measly three cents from an AdSense click. 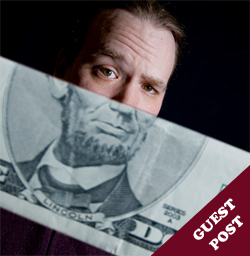 So how can you make money from your blog other than with advertising? You need to offer something for sale that your site visitors will be highly motivated to buy. You’re much more likely to find monetary success from your blog if you use it as a vehicle to help people solve or prevent problems or pain. Stop and think about what problems you’ve solved for you, and how you could help other people solve those very same things. Write an e-book about how you overcame obesity, beat depression or quit smoking. In addition, a paid monthly newsletter, recurring-fee membership or suites of video tutorials could make up your catalog of products for sale. Rather than seeing your blog as your core business, think of it as a platform to provide valuable free advice that connects and builds trust with your audience. At the same time, use your blog to promote your products and services that further help your readers with their problems. If you can do that, then you will be well on your way to making money from blogging and creating a sound online business. it is true, most of the ad advertising stuff is usually not very good revenue. i think writing an e-book is a good idea. I use my blogs as a space to share thoughts and tp help others as well as a place to put affiliate ads. I have 4-5 blogs on various topics…..that gives me more opportunities to make some cash. And of course, you have to promote the blog posts on Twitter and Facebook…. It’s a lot of work – it’s not just creating a post, hitting publish, and going back to bed!